Ashy skin is a very common concern amongst the mySkin community. Don’t let ashy skin get your down: we have tips to help ease your skin’s trouble. For those who haven’t heard about it before, ashy skin is really just and extreme case of dry skin. You know you have ashy skin when areas of the skin appear slightly whiter than the rest, or when skin has a dull, chalky, flaky overall appearance. It can also feel tight and even painful. These patches of dry, itchy skin can occur anywhere on the body but it’s most commonly found on arms, hands, legs, and abdomen. Knees and elbows usually have it the worst. Are some people more prone to ashy skin? While ashy skin can occur in people of all skin tones, because of the contrast of the lighter dry skin, ashy skin tends to be exacerbated in people of darker skin tones where it is more noticeable. 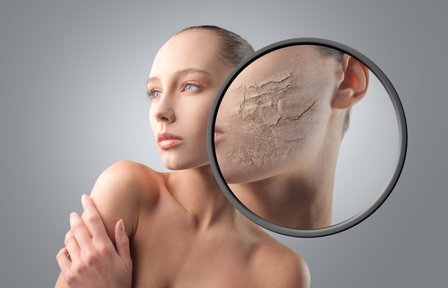 Dry skin can be caused by a variety of issues. Certain medications, especially those for diabetes, malnutrition, hypothyroidism, and psoriasis. Genetic predisposition for dry skin. Moisturize. Try using thicker creams which can work better than lotions. If your skin is extremely dry, apply cocoa butter, almond or vitamin E oil right after your shower or bath, while it’s still moist. Oil has more staying power than moisturizers and prevents water evaporation. To wash your skin, don’t use anything that says “soap” which can strip away the skin’s protective natural oils. Use cleansing creams, gentle skin cleansers or bath or shower gels with moisturizers, not harsh soap. For laundry, use fragrance-free detergents that won’t irritate. Feel free to skip fabric softeners, unless they are specifically made for sensitive skin. To create a proper environment for your skin, keep your home between 68 and 75 degrees, and use a humidifier to maintain 40-50% humidity. Lifestyle: Having a darker skin tone does not exempt you from the smart rules of the sun. Apply sunscreen liberally to all exposed areas 30 minutes before you go outside, even on cloudy days. Avoid direct sun exposure, especially between 10am and 2 p.m. If you must be outside, cover up and wear a hat. Don’t smoke and make sure you’re getting 7-8 hours of sleep every night to allow your skin to renew. Avoid alcohol and caffeine because they’re diuretics and cause the body and skin cells to lose fluids and important minerals. See a Doctor – If the dry, ashy skin continues, seeing a doctor is definitely the next step. A qualified doctor can prescribe prescription medication and lotions to help you with this. Learn more about your skin from beneath the surface with a personalized assessment by OKU. Get lifestyle, diet and product tips based on your results as well as ongoing coaching to help you reach your skin health goals. Learn more at getoku.com!